Seeing the natural beauty of the islands is one of the best reasons to visit Hawaii, and hiking offers a great opportunity for stunning panoramic views. While Hawaii can be an expensive destination, hiking offers free and gorgeous entertainment. There are many hikes to choose from on the island of Oahu, but one of the easiest, yet with some of the most rewarding views, is the short hike to the Makapu'u lighthouse on Oahu. The hike itself is officially located in the Kaiwi State Scenic Shoreline park, but most people just refer to it as the Makapu'u lighthouse, which you can see at the top of the trail. 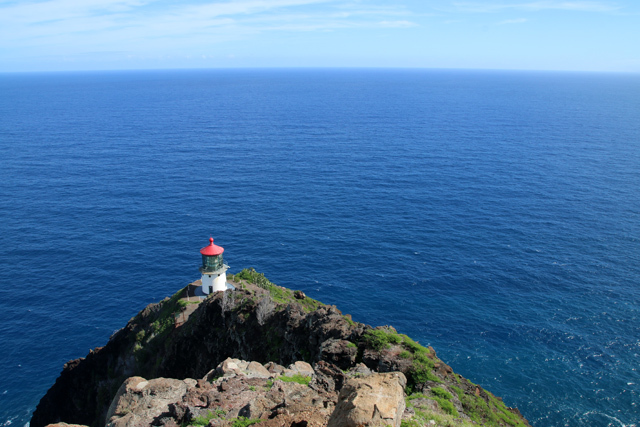 The Makapu'u lighthouse is located at the very southeastern tip of the island of Oahu. There's a parking lot where you can leave your car to begin hiking. The hike is very easy as the entire trail is paved and gradually increases in elevation. There are plenty of people that come to exercise up and down the mountain, and it's also a good place to bring kids, or even infants in a stroller. Another reason to take the hike is for the likely chance, in the right time of the year, for seeing humpback whales. 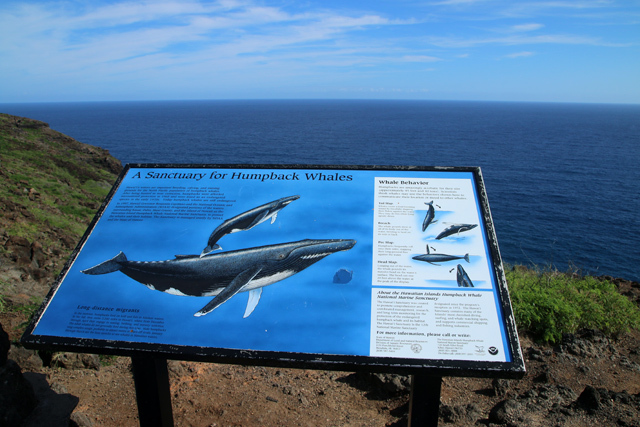 The season normally runs from about December through March or April each year and the sight of giant bus-sized humpback whales in the blue seas below is amazing. The last time I went, I was able to spot a few whales, breaching out of the surface of the water below. For the most part, the Makapu'u area and the entire southeast region of Oahu is considered to be quite dry, that is in comparison to other parts of the island. 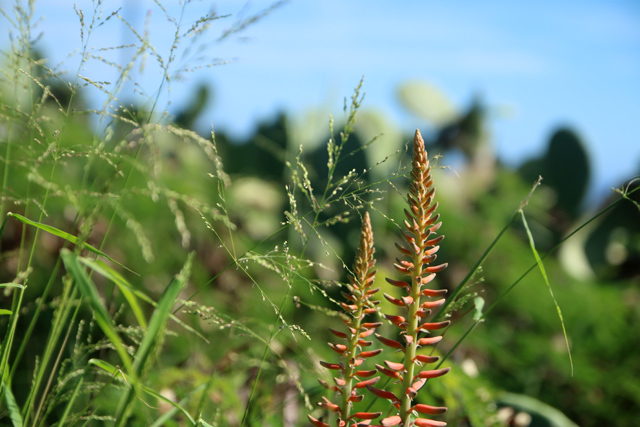 There's no jungle like on the higher mountains of Oahu, but the landscape is made of low lying brush, grass, small trees, and flowers. The coast shoreline is mainly rocky cliffs, until you go a little bit north where there's more sandy beaches. The Makapu'u lighthouse, being on the very southeastern most point of Oahu, is in a very strategic position. When it was formerly in use, it would direct ships en-route to Honolulu from the mainland of the US. The lighthouse was constructed in 1909 and at the time of being built, it had the largest lens of any lighthouse in the United States. It is 46 feet high, has an intensity of 115,000 candlepower white, and can be seen from a distance of 17 nautical miles. When you arrive at the end of the hike, from the main viewpoint, look down, and you'll see the lighthouse. The lighthouse itself is now shut and can only be viewed looking down from a distance. The main attraction is the incredible view that never gets old. 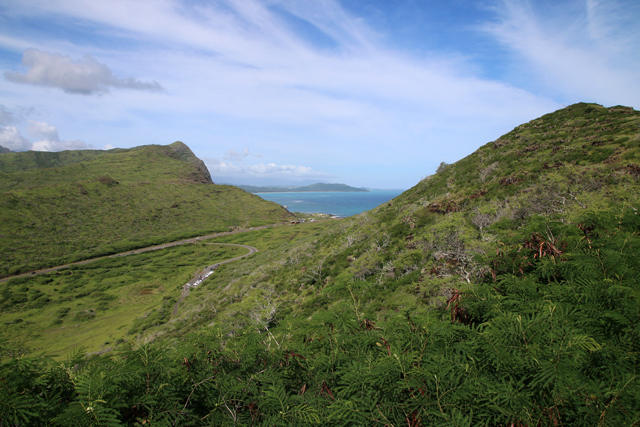 At the top of the hike, the view of the windward side of Oahu is spectacular. It gives you a great perspective of the rugged mountains, rough seas, and beautiful beaches of the southeastern tip of the island. The Makapu'u lighthouse hike only takes about 30 minutes to complete and it's an easy climb up a paved road. 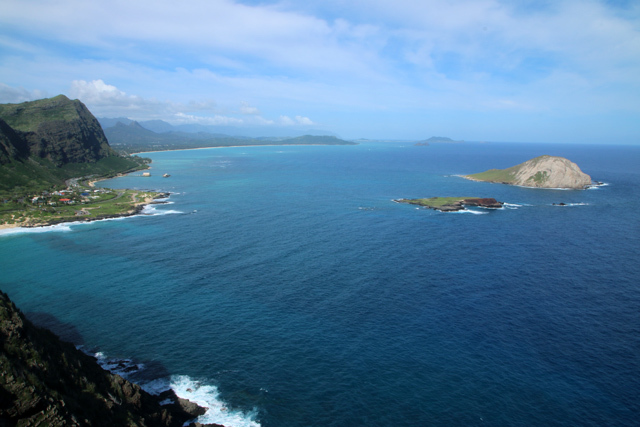 For such a short and easy hike it offers some incredible panoramic views of the island and the coast of Oahu. Loved this post! Looks like a lovely hike, even if its just for the humpback whales. I fell in love with these magical creatures when I lived rural in Mozambique, Africa. Glad you enjoyed it Ruann. Maybe we can get Mark to write more about Hawaii here in 2014.